The opportunity of playing golf inside your own house is already a tremendous thing for the persons that can afford it, but how about creating your own golf courses with the help of the simulator? This can be considered another great advantage brought by this device for the ones that can afford it. All the indoor golf simulators you can buy now have some real courses preloaded and offer the possibility of loading others at any time. However, some may get bored with real courses, or may find the difficulty inappropriate for their skills. Here comes the beauty of a golf simulator. Because it is software controlled, you can create your own golf courses from scratch with the help of the computer. And don’t think that it is very complicated. 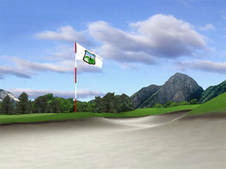 Actually, if you can use the golf simulator, we are sure that you will have no problems in creating your own golf courses. The interfaces of this type of software are usually very simple and you just have to use the mouse to select surfaces, add elevations or objects like trees and lakes. By using the Internet you can share your work with all your friends and challenge them to obtain the best results on the golf course you have created. You will find it very interesting that you can create situations that cannot be found in reality.